This workflow describes how to import, compute, and measure ground control points (GCPs) in your ortho mapping workspace. GCPs are points with known x,y,z ground coordinates, often obtained from ground survey, and used to ensure that the photogrammetric process has reference points on the ground. In a block adjustment, overlapping images are tied together to minimize error between all tie points and ground control points, if available. Block adjustment can be applied without GCPs and still ensure relative accuracy, but adding GCPs increases the absolute accuracy of the adjusted imagery. Check points are GCPs that are excluded from the adjustment calculation, and are used to determine the accuracy of the adjustment. GCPs can be imported from survey data using the Import GCPs tool, or computed using a reference image with the Compute GCPs tool. GCP measurement, or tie point creation, can be done in the GCP Manager. These tools can be accessed from the Manage GCPs menu in the Refine group under the Ortho Mapping tab. When working with satellite or aerial digital data, GCPs can be added to your workspace before the initial adjustment is computed. When working with drone or scanned aerial imagery, a block adjustment must be performed before GCPs can be added. If you have existing ground survey data, you can import your GCPs into the ortho mapping workspace. Click the Import GCPs tool from the Manage GCPs menu. Browse to the location of the GCP File, which can be a .csv or .txt file, feature class, or shapefile. The fields in the file should include the GCP Label, X coordinate, Y coordinate, Z coordinate, XY accuracy, and Z accuracy. Specify the spatial reference and vertical coordinate system of the GCPs. If the coordinate system of the GCPs is different than that of the ortho mapping workspace, specify the horizontal and vertical geographic transformations to apply. Note that when working with a satellite ortho mapping workspace, the vertical coordinate system will always be converted to WGS84 Ellipsoidal. Specify which fields in your GCP File correspond to the field mapping parameters listed. If your GCP data comes with photos of the location where the GCPs were measured, specify the location of the folder containing the photos. The name of the photo should match the GCP Label. If there are multiple photos for each GCP, the name of the photo should include a number appended to the Label, which will be used as a unique identifier. For example, GCP20_1.jpg, and GCP20_2.jpg are the photos for GCP20. Check the box to import only the GCPs that exist within your current display extent. The default is to import all GCPs. If your images and GCPs have different z-values, for example, if you specified a constant z-value when defining your orthomosaic, your imagery may appear to be shifted in the map after the adjustment. To visualize the adjustment result on GCPs, use the Show GCP button to display them in the GCP Manager. The image shift visible in the map will be corrected after you apply a refined elevation when creating your ortho mosaic product. If you do not have GCPs from ground survey, but you have a georeferenced raster layer (raster dataset, mosaic dataset, or image service) that has a resolution similar to your image collection and a higher suitable accuracy, you can add it as a reference to compute GCPs. Click the Compute GCPs tool from the Manage GCPs menu. Browse to the location of the Reference Image. Specify the Image Location Accuracy of the image collection, as well as the Point Similarity, Point Density and Point Distribution of your output GCPs. After the GCPs are imported or computed, select the Manage GCPs tool from the Manage GCPs menu to open the GCP Manager, which allows you to add the tie points for your GCPs. In photogrammetry, this process is known as creating a measured tie point, or a tie point that has been provided to an image that corresponds to a GCP. You can also use the GCP Manager to manually add GCPs to your workspace. Select a GCP from the list, and the corresponding images that overlap with the GCP appear in the image list at the bottom of the GCP Manager. Click the Add GCP or Tie Point button to add an image tie point in the image viewer for each overlapping image. The tie points for other images will be automatically calculated by the image matching algorithm when possible, but each tie point should be checked for measurement. When a tie point has been successfully added to an image, the gray tie point symbol will change to blue in the image viewer list. Use the pointer to change the location of the tie point. The Clear Links button is used to delete tie points from images, and the Delete GCP button is used to delete a selected GCP and all the associated tie points for that GCP. In the image viewer, you can zoom to the full extent of the selected image using the Zoom button , stretch the selected image based on the pixel values within the display using the Dynamic Range Adjustment button , or turn the selected GCP on or off in the image viewer using the Show GCP button . For a full list of the tools available in the GCP Manager, see GCP Manager. The steps below describe how to convert GCPs to check points for accuracy assessment. Check points are conceptually the same as GCPs; they are points with known ground coordinates with links to features visible in multiple overlapping images. However, they are not used as inputs to control the adjustment process. Instead, check points measure the accuracy of the adjustment and the resulting orthoimage. For each check point, the distance between its known ground location and the location of the corresponding pixel after the adjustment process is used to calculate the overall absolute accuracy of the block of images. Accuracy measurements are summarized as the check points root mean square error (RMSE) and can be found in the Adjustment Report. GCPs can be converted to check points for post-processing accuracy assessment. After your GCPs have been added and measured with tie points in your ortho mapping workspace, select the GCP you want to convert to a check point in the GCP Manager pane. Right-click the GCP and select Change to Check Point. 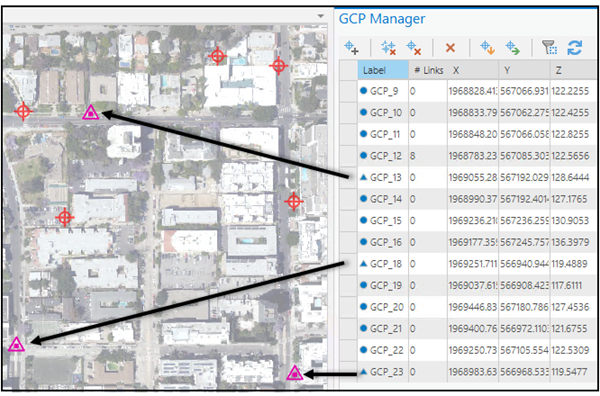 The check points are displayed as pink triangles in the ortho mapping workspace map, and the Label icon in the GCP Manager changes from a blue circle to a blue triangle. GCPs should always be on the ground, not on an elevated feature such as a rooftop, tree, or the top of a fire hydrant. If you don't have a GCP file and you need to measure GCPs on a reference map, use the Manage GCPs tool to enter a GCP by clicking a location on the map and adding the corresponding tie points in the viewers. The accuracy of these secondary GCPs depends on the accuracy of the reference map. Double-click a row in the GCP Manager to pan to the GCP location in the image viewer at the current display scale. When the pointer is in point collecting mode, you can press and hold the C key to switch to the explore pointer. The shortcut to turn dynamic range adjustment (DRA) on and off is Ctrl+D. The shortcut to zoom to the full extent of the image is Ctrl+F. Try running an adjustment with check points, assessing the accuracy in the Adjustment Report, then changing different GCPs to check points. Rerun the adjustment and see how the resulting RMSE changes. To learn about creating ortho mapping products, see Generate ortho mapping products.